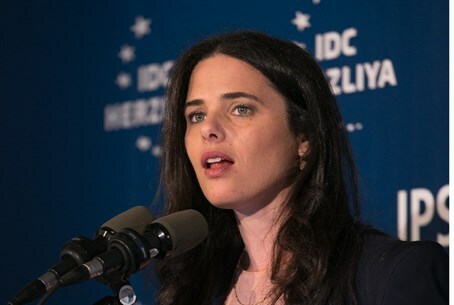 Justice Minister Ayelet Shaked (Jewish Home) has defended her party from charges it should never have agreed to a cancellation of conversion reforms when it joined the ruling Coalition. Her comments come after the Religious Affairs Ministry - now controlled by the haredi Shas party - essentially undid the reforms enacted by the previous government, when the ministry was controlled by Shaked's Jewish Home party. Those initial reforms were hailed by campaigners as making the rabbinate more accessible to regular Israelis, while Shas's decision to cancel them has been heavily criticized by some. But Shaked insisted her party had no choice but to accept the terms. "Netanyahu closed the deal with the haredim over our heads because of the pressure from Liberman in the Opposition,” Shaked told Galei Israel radio. It was clear from the outset, she added, that the Conversion Law that had been hammered out with secularist Yesh Atid in the previous government was doomed. Shaked also said Monday that she will consider splitting the Attorney General's current wide authority between two officials. However, she said, this thought process will only begin after a new A-G is appointed. The splitting of the A-G's functions has long been a goal of Israeli nationalists. At present, the Attorney General is also the Legal Advisor to the Government. This gives him overweening power, which is often described as bigger than that of a prime minister. Traditionally, this power tends to serve the Left. The Legal Advisor advises ministers on how to vote on certain issues and how to behave. At the same time, as A-G, he has the power to put them on trial. Needless to say, this makes it possible for him to exert political pressure.